Now that the weather’s heating up, how can homeowners with young children encourage pool safety? Summertime brings great weather, and with it, backyard activities for the whole family. But yards, like any other area of the home, should be considered in terms of the risks they pose to young children. In particular, pools can be an especially dangerous component of a yard if left unattended. 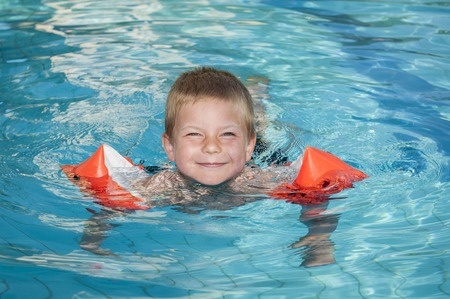 While most parents would attest that they’d never leave their child unattended long enough to allow him or her to get into a pool, any parent must also concede that children have a nasty habit of wandering off with surprising ease. That’s in part why pools are the leading cause of unintentional injury-related death, particularly among children aged one to five. That’s also why taking the following proactive steps can help prevent disaster at the pool. Safety Begins at Home. Before even beginning to think of how to best protect a child from wandering into a backyard pool, it’s important to think of ways to keep them from getting outside in the first place. A simple door alarm can be purchased for cheap and affixed easily to any door that would provide access to a pool. Such alarms can be deactivated when necessary, lessening their potential to inconvenience. Pool Barriers Make a Difference. Pool barriers are a popular safety feature and for good reason. A pool barrier, up to code and properly installed, can be an effective deterrent to prevent children from wandering into a pool. Homeowners are afforded two options for pool barriers: complete and partial enclosures. Because partial enclosures have an open segment attached to the home, they provide less protection for children than complete enclosures. That’s why complete enclosures, tall enough and lacking any potential footholds for children to climb—without any large gaps—are the preferred barrier variety. Pool Technology Saves Lives. When most people think of pool technology, many things may come to mind, including pool lighting, cleaning supplies or flotation devices. But pool safety devices have also taken on a high-tech overhaul. Water disturbance sensors, for example, can sound an alarm if they detect a disturbance. Child wristbands that alert parents when submerged in water are also readily available, trading off a child’s potential mild discomfort for real peace of mind. Automatic pool safety covers are another excellent choice for the concerned parent, with models now being required to hold the weight of two adults and a child. The potential implications of an unattended child gaining access to a pool are obvious and frightening. By following a few commonsense approaches and making use of relatively inexpensive pool safety technology, you’ll be able to enjoy the summer season to the fullest extent, with your biggest fear being how to deal with nasty mosquito bites and sunburn. What Color Conveys the Mood You Want in Your Home?